Can-Con 2017 in Ottawa was a great event for On Spec. At least twenty of the authors attending the convention have been published in On Spec over the years. 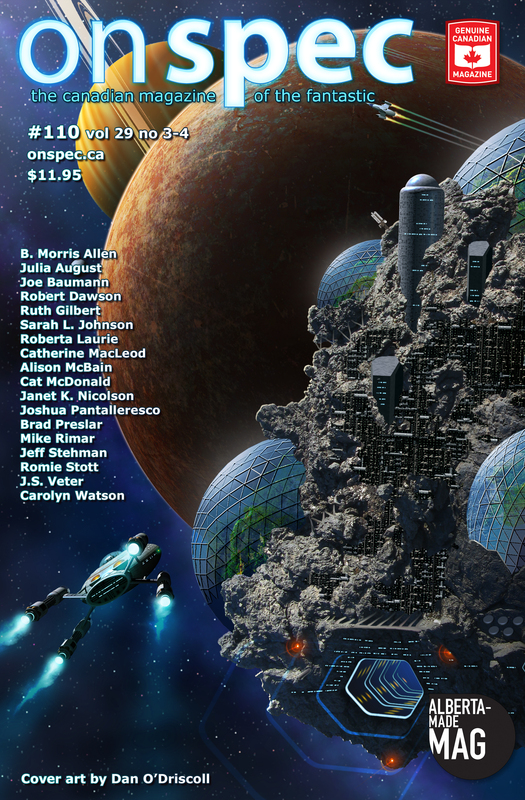 We had a panel to talk about the early years of On Spec, and what it has meant to Canadian writers to have us publish their first work of SF. At the end of the panel, Diane asked members of the audience to stand if they have been published in On Spec, and then several stayed for a group photo. From left to right: (standing) Yves Meynard; John Park; Leslie Brown; Jerome Stueart; Matt Moore; Chadwick Ginther; Leah Bobet; Hayden Trenholm; Diane Walton; James Alan Gardner; Susan Forest; Brandon Crilly; Suzanne Church. (seated) Allan Weiss; Mike Rimar. AMPA has a gift to readers, and so do we! On Spec is a member of the Alberta Magazine Publishers Association (AMPA) and they are in the middle of a promotional campaign for member magazines called Alberta Unbound. Each magazine was asked to provide a story from the previous year that they felt represented them. Our contribution was the delightful “When Phakack Came to Steal Papa, A Ti-Jean Story”, written by Calgary’s Ace Jordyn, and published in our issue # 103 (out of stock in print, but available in digital format from our distributors). So follow the links for some reading pleasure, and tell your friends about On Spec. Need we remind you that a subscription to On Spec makes a great holiday gift? Congratulations to the Aurora Award Winners! The Aurora Awards were handed out last night at Hal-Con in Halifax, NS. It’s a celebration of excellence in Canadian Speculative Fiction and Fandom. Results can be seen at the link below. For the past few months, On Spec has been showing up in some new places. This weekend, it’s in St. John’s NL, on the table of the Myth Hawker Travelling Bookstore, a venture operated by the amazing Pat Flewwelling. We are thrilled, because it gets On Spec into the hands of new readers in a variety of places across the country. Our resources are limited for marketing and promotion, and the in-person process is always the best. Pat also is helping to promote and sell a number of books by some excellent Canadian authors who deserve an audience. So if Pat is at a convention or book event in your neighbourhood, do drop by and say hello, and buy a book or copy of On Spec from her. We will have a table in the Vendor Room at the upcoming When Words Collide festival in Calgary. You can still get on the wait list, but officially, the 2017 memberships are sold out. If you buy a new On Spec subscription at WWC (or within the month of August) we will give you a free back issue as long as supplies last. On Spec Author from Calgary on Aurora 2017 Ballot! We are absolutely thrilled that Calgary author, Ace Jordyn, is a finalist for the 2017 Aurora Award for Best Short Fiction, with her delightful folk-tale, “When Phakack Came to Steal Papa, a Ti-Jean Story”. Voting for the Auroras begins in July, and the winners will be announced at HalCon in September. By paying the $10 voting fee, members of CSFFA will be able to read all the nominated works before they cast their ballot. Many believe that science fiction originated with Jules Verne, but science fiction as a genre is older than that. With exploration and the spread of humanism, we have the emergence of science fiction in Thomas Moore’s Utopia published 1516, in which a perfect island nation is depicted. Later, Anton Francesco Doni published a book I Mondi. In 1623, Thomas Campanella wrote The City of The Sun. After the publication of Galieo’s map of the moon, Ben Jonson wrote a masque for the court of James I called Newes For the New World Discovered in The Moone in which there are moon people riding in clouds. In Francis Godwin book in 1638, the antihero Domingo Gonsales visits the moon in a carriage towed by geese using the technology of another world. This was the first time any author used anything like this. In 1648, Samuel Gott’s first novel, Nova Solyma, is set in the future. The author Margaret Cavendish wrote The Blazing World in 1666 in which there is another world attached to one of the earth’s poles. Congrats to BSFA Award Winners! The British Science Fiction Association Awards have been announced. We are pleased to see the names of two authors previously published in On Spec, Jaine Fenn (winner Best Shorter Fiction category) and Aliya Whiteley (short-listed in Best Shorter Fiction category). Jaine’s story “The Path to the Sun” appeared in On Spec in 2002 and Aliya’s story “To the Farm” was in our Winter 2015-16 issue. Congratulations to both authors!